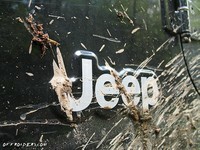 Jeep is an automobile marque of Chrysler, which in turn is a marque of Fiat. The marque has gone through many owners, starting with Willys, which produced the first Civilian Jeep (CJ) in 1945 and who were the first granted the trademark in 1950. Willys was sold to Kaiser Motors in 1953, which became Kaiser-Jeep in 1963. American Motors Corporation (AMC) purchased Kaiser's money-losing Jeep operations in 1970. The utility vehicles complemented AMC's passenger car business by sharing components, achieving volume efficiencies, as well as capitalizing on Jeep's international and government markets. Compass is a 4-door, 5-passenger sport-utility. Grand Cherokee is a 4-door, 5-passenger sport-utility. Liberty is a 4-door, 5-passenger sport-utility. Patriot is a 4-door, 5-passenger sport-utility. Wrangler is a 2-door, 4-passenger sport-utility. Wrangler Unlimited is a 4-door, 5-passenger sport-utility.